All Q&A are wrote by me, skhong/tabtab. - First of all, please check most of the buyers are not from Malaysia, They bought directly from China, sure cannot work in their country. The most important thing is, they are not my customer/buyer. - Secondly, all my buyers are HAPPY with the watch bought from me, as it is fully supported in Malaysia, no offline issue, my watch ID can be reset by our team. Welcome all my buyers... leave your comment on setracker in play store, and mention skhong/tabtab is your seller. Thanks!!! This is due to your area is incorrect, please change it to "ASIA AND OCEANIA", it will solve your problem. How to set silent (school time/class time) for the watch? - In settings - "do not disturb", please set the time (applicable from Monday to Friday only), and enable it. At least start with 00:01, and end with 23:59. DO NOT set 00:00 to 00:00, it will not activate. - During the "do not disturb" time, the watch will reject all calls, the watch will not ring. - It still able to receive voice/text message, silently, but the watch able to listen the message. How many photo F26 can store? - Only one photo. If take more than once, new photo will replace old photo. - After take picture, can send to apps in the album folder. Parents can also take picture remotely to monitor their kids. 1. How to make call from the watch? 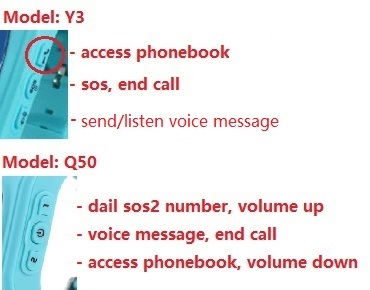 - Press up (Y3) or down (Q50) button to access phonebook, then pres up and down to select which contact you want to call, then press long (mean press and hold the button for 3-5 seconds) to make call (up [Y3] or down [Q50]). 2. What is "monitoring" in the setracker? Can I change to the watch phone number permanently? -Monitoring call has been blocked (as requested by European Union), as spy call is illegal worldwide. 3. How to send voice message from the watch to phone? - For Q50, press and hold the power button for 3-5 second to start recording, and release the button to send. - For Y3, press the microphone icon button for for 3-5 second to start recording, and release the button to send. 4. How to save phonebook to the watch? - You must insert sim card with data plan to the watch, then you can add phone number in the app (setracker) from your handphone, in app settings - phonebook. P/s: Please remove +6 in front of your phone number, this is common problem which user will input +60123456789. Please direct input 0123456789. 5. What is difference between phonebook and contact in the setracker? 6. Why watch display off after few seconds. Can let it on all the time? No, cannot turn on the display all the time, it is to save battery. This is not normal watch, as it use SIM card, and the network signal will consume a lot of battery, just like your handphone cannot turn on the display all day long. 7. How do I adjust volume for the ringtone? - Yes for Q50, and No for Y3. - When the watch is ringing, press up button on the watch to increase volume (Max. 7), or down button to lower the volume. And the same for call volume. 8. Can I monitor the watch using my second phone? 9. Can I retrieve same message on the watch after reading or hearing it? - No, you cannot. The message will display once only until you press any button on the watch to close it. 11. Can I swap/change another SIM card? Do I need to register again? - Just swap/change the SIM card, no setting needed, and no need to register again. Remember to restart the watch after new sim card inserted. - Note: Your registered account is linked to the watch ID, not the SIM card. 12. Why my phone doesn't show notification like new voice message received? - This is not the app problem. Please check your phone setting to allow notification for the app. If you already allowed notification, but still cannot receive, advise you DO NOT exit/close the app. Press home button to return to your android home screen and let the setracker run in the background. 13. Can you suggest the best telco and plan? - Can use both prepaid and postpaid, no matter, as long as it is call + data plan. 14. Does this watch SIM card plan requires voice or just data plan? - It need both voice + data plan. - If no voice plan, you cannot call the watch, and monitoring call doesn't work. - If no data plan, you cannot send voice message (intercom), and cannot track the watch location. 15. I bought the watch from other seller, can you provide support? - No!!! I only provide technical support for the watch bought from me. Other seller's watches are in different format, and their watch ID is not in our server (not belong to us), I cannot do anything even you willing to pay. 16. I have forgotten my login username and password, what shoud I do? - Please try to click "Forget password?" in the app login page, then input the watch ID, account and phone number registered. 17. Why the map show "China map", or device offline? - It is because your watch is not online, make sure your SIM card has internet data plan (make sure your telco support 2G GSM network or GPRS enabled). 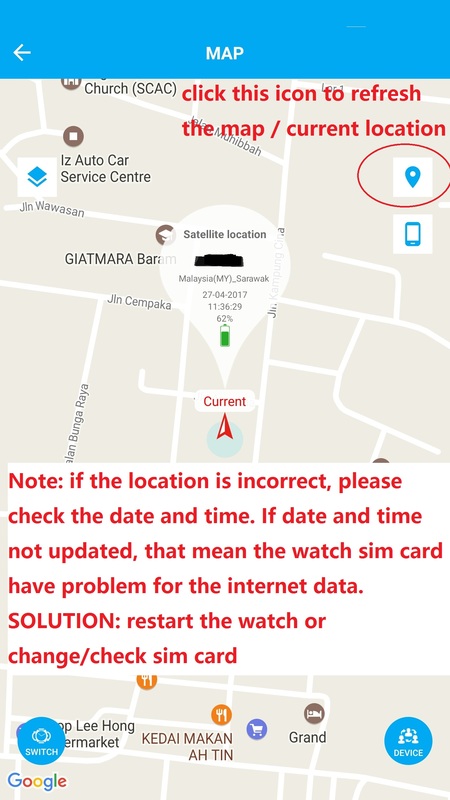 It will show your current location (Malaysia) after your watch is online. 18. The time and date is incorrect even the watch is online? - It coule be time server problem and it's temporary only. SMS this code to manually adjust the date and time. - SMS "pw,123456,time,11.57.00,date,2017.01.30#" (without quote) to the watch phone number. SMS "pw,123456,ts#" (without quote) to your watch phone number, the watch will reply with the info after few seconds. 20. Can I switch off the watch if the watch is online? - No, you cannot switch off the watch by pressing the power button when the watch is online/connected to the app, this is to prevent your kid switch off the watch accidentally. - You can remote shutdown the watch in the app (setracker) or manually shutdown, see below. - To manually switch off the watch. Press SOS button 5 times, then up(1) button 1 time, and down(2) button 1 time, must do it quickly. 21. My watch show "SIM 1 PIN", and I cannot switch off the watch. - Please take out the SIM card and remove/disable the SIM PIN from your phone (google your phone setting how to remove SIM PIN), it is not my responsible to find the setting for your phone. - To manually switch off the watch. Press SOS button 5 times, then up(1) button 1 time, and down(2) button 1 time. - After SIM PIN removed, insert SIM card in watch and switch on the watch again. - It is because the watch did not connected to "GPS/satellites" when the sms sent to your phone, it might be connected to lbs or wifi positioning, but not GPS. We cannot do setting for this, it's auto connect (GPS, LBS, WIFI(Y3 only)). What you need to do? Just open the APP (setracker), and manually check the watch current location in the map. 23. Battery consumption is quite high, can last for 1 day of less, how to utilize it? - Yes, GPS will consume a lot of power. You can change the work mode in the settings (setracker). Open setracker - settings - work mode. Change from normal mode:10m/t to power save mode:1h/t. - Work mode is the frequency of the GPS to open and work. e.g normal mode:10m/t, GPS will open every 10 minutes to searching for GPS signal. Power save mode:1h/t, GPS will open every 1 hour to searching for GPS signal. Don't worry, you can check the watch location anytime (force GPS to work) by clicking the locate button in the map. 25. What the watch sometimes offline? - Please check your sim card network, if there is no problem with the network data, then you need to change another Telco. I received many feedback from users, it is advised not to use DIGI sim card, as DIGI has very poor network in Malaysia (based on my own experience and other customers). Yes, your phone no problem with the DIGI line, but this is small watch and less radiation and it doesn't have very strong reception like phone, it will be dangerous to your child. Note: if you are using webe sim card in the watch, please use your phone to SMS (normal SMS) this code (pw,123456,apn,webe,,,#) to the webe number in the watch. then send to the webe phone number 0133333333 in the watch. Why we doing this setting for webe? because webe is A new company, and webe APN doesn't exist in the watch, so we have to manually add this APN to the watch. - Don't use fast charging adapter to charge the watch, it cannot support 9V adapter.